Has been almost a year since my last post and can remember my daughter, who is a professional ‘blogger’ and SEO, saying that most blogs fail within 3 month as the initial novelty wears off. Well this has not been the case as far as I am concerned as I started this blog over 8 years ago and had posted every month since and only due to other things going on in my life and time restraints that have made me a little remiss in posting any updates. But that’s enough of my feeble excuses. A lot has happened since my last post way back in the summer of last year. We have had the installation of a new Worshipful Master at our October meeting, where we had almost 40 attending, witnessing W.Bro Simon Thomas installed as Master. Followed by a Second Degree ceremony in January where we passed Bro George and on Friday the 8th March we had another great turnout with over 16 guests including the PProvGM of the Canary Islands in attendance and the pleasure of welcoming W.Bro Norman our Joining Member and initiating 2 great young guys into Freemasonry and North Harrow Lodge. At most meetings, don’t always go without a hitch. W.Bro David Olive, who had proposed Matthew, the first of our initiates, wished to perform the entire ceremony for him. This meant that it would be a rather long meeting as Leon, our second candidate, would be initiated afterwards by our WM. However, at the last minute our WM was unable to attend the meeting due to business commitments. 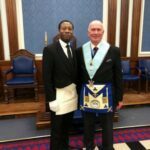 So David stepped up to the plate at the eleventh hour and not only initiated both candidates consecutively but also welcomed one of our new joining members. 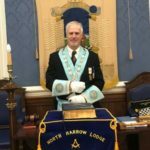 Many congratulations must go to W.Bro David and it goes to show the benefits of attending Lodge of Instructions on a regular basis because his ritual for all were superb. 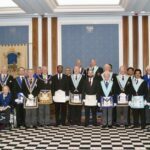 Looking back we have been very fortunate in North Harrow Lodge over the last 8 years to have initiated over 22 sponsored and unsponsored candidates, many of whom have come through our website and Social Media at a time when we were struggling for members. With a membership of 20 at that time to one of 43 to date, we are now reaping the benefits of that initiative with a thriving, active membership, whilst achieving a 90% retention rate through our mentoring program and long may it continue. held one of the most important events in the Lodge’s social calendar, that of our Ladies’ Night. 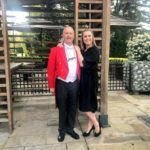 After almost nine months of planning the event was held at the Runnymede-on-Thames Hotel, a superb venue situated in the beautiful banks of the Thames at Egham in Surrey. 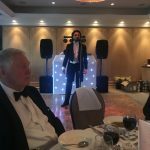 Over 64 members along with partners and guests turned up for welcome drinks on the terrace overlooking the river at 6 pm in anticipation of performances by Vasili Karpiak, one of the celebrated singers who performed at United Grand Lodge’s Tercentenary celebrations at the Royal Albert Hall last year. the evening went like clockwork with our President W Bro Leonardo Monno taking wine toasts with numerous members of his family friends and members of this and other Lodges present. Letters of greetings were read out from Her Majesty the Queen on the occasion of her 92nd birthday and their Royal Highnesses The Duke and Duchess of Cornwall, who offered their apologies on not being able to attend due to other engagements. 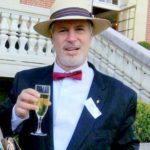 on behalf of Ladies to Vaughan Coleridge-Matthews, who delivered a humorous toast to the Ladies to rapturous laughter and our President Leonardo Monno responded to Terry Clayfield’s toast to the President. The evening continued until 12 pm to great music and dancing under the direction of the resident DJ. Another great evening was had by all. 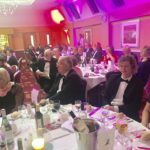 Many thanks must go to the organising committee and the Runnymede Hotel who went the extra mile to accommodate us superbly and make the evening such a success. 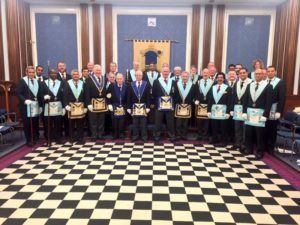 We again started on a high with another initiation at our January meeting . 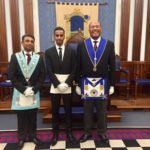 Our WM, Rimal, who incidentally was the first of our internet initiates in 2011, did a sterling job during his year having conducted all three Degrees during his mastership and as a plus during the Tercentennial year of United Grand Lodge we have been able to increase our membership to in excess of 40 whilst reducing the average membership age from 67 years in 2012 to 51 to date with a third aged under 45.
what another cracker with a second degree and another initiation with over ten lay brethren taking part and performing small pieces of ritual, followed by a great festive board with over 38 attending. Is the highlight of the Lodge’s Social calendar and was held at The Watford Hilton Hotel where about 90 members, partners and guests attended a wonderful evening of food, fun and fellowship and of course dancing… This year it is at the Runnymede Hotel at Egham on the 21st April and the ticket price is under £50 pp. Why not come along and join in the fun. The theme is ‘A night at the Opera’ Phantom? was just as enjoyable with the 3rd Degree of one of our members at the tender age of 22 making him our youngest Master Mason. The ritual was superb with many of our young guys performing for the first time. It was a pleasure to behold. 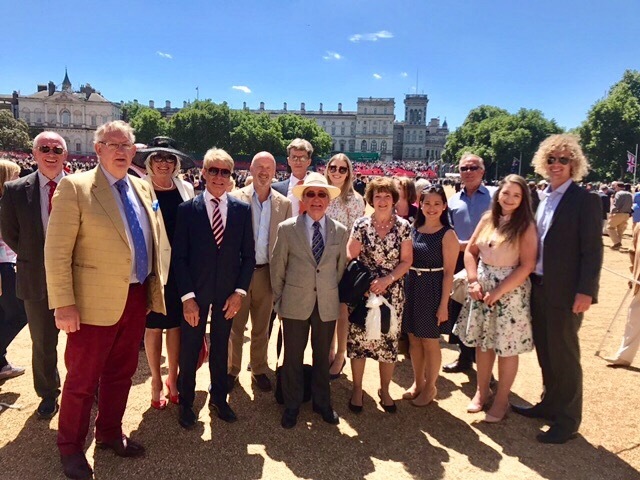 over 35 enjoyed a Barby at Bro Secy’s Home, a visit to Guild Hall L3116 at Mansion House to witness the installation of the Lord Mayor of London as WM, a visit to Tara L1541 in Paris for a Lodge twinning , we wallowed through the mud at Hatfield House Game Fair, got drenched on a 40′ Yacht during our usual sailing weekend on the Solent, scorched whilst watching Trooping the Colour at Horse Guards and thoroughly enjoyed lunch at the East India Club and at Lord’s Cricket Ground, the Boar’s Head Ceremony lunch at Pewterers’ Hall and afterwards at Mansion House and of course the Tercentenary Meeting at the Royal Albert Hall was a treat. well, you will have to wait and see. An initiation is scheduled for January, followed by maybe a double initiation and a second in March and a third in May, yet again giving our WM a chance to perform all three ceremonies during his year, if he so wishes. Its not often that Santa comes early bearing gifts and bringing great joy. 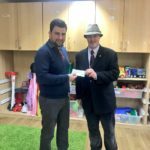 our WM and Charity Steward had great pleasure in presenting a cheque for £300 on Monday 20th November to mark the Tercentenary of United Grand Lodge to “Kids Can Achieve” a local based Charity based in Harrow Weald this morning to enable them to have a Christmas Party for the Kids, parents and sibling at Christmas. As the centre manager explained, They ran a Christmas party last year for the first time and was wondering if they could run one again this year with all the cutbacks. This money will enable them to do so. Thank you so much…. Santa came early and at the right time. “So – look – I have a plan. It’s not an order – it’s not a directive – if you don’t like it – fine – if you don’t want to do it – fine. 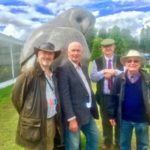 But, it’s a plan – and I think it would be a terrific plan if you support it, and it can be done without any significant detriment to the Festival – but with terrific benefit to our local charities, and with great pride and satisfaction to our individual Lodges, Chapters, Brethren and Companions. I would like our Lodges and Chapters – well, those who would like to get involved – to choose their favourite local charity – preferably one where you could make a difference at Christmas (for a kids party, an OAP’s Christmas lunch – something fun – presents for under- privileged kids – that sort of thing) and give them a Tercentenary gift of £300 to make their Christmas a little bit special. Tell them it’s to celebrate our 300 years of trying to make others happier. 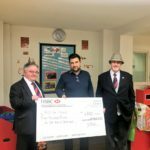 I’d like you to get in touch and go along and give them the money personally – tell them you just want them to use it for some Christmas fun – and have a terrific time. 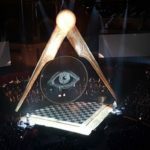 As always, this is what Freemasonry does best and this time at the right time. were held at the Royal Albert Hall on Tuesday 31st October. 2017 and was a feast for the senses. The whole event was being streamed live and is available to watch as a catchup at RAH300.org was superbly organised and ran smoothly despite the Piccadilly Line’s attempts to make me miss it by its glacial approach to mass transfer. 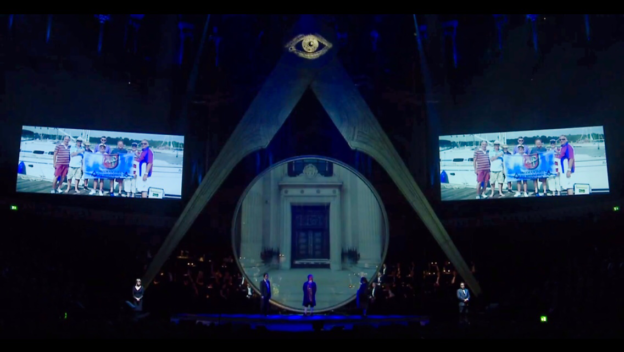 What a glorious occasion with some 4,500 Freemasons including 136 Grand Masters from around the world seated in one of London’s premier entertainment venues, enjoying a spectacular theatrical presentation, led by Sir Derek Jacobi, profiling the progress of Freemasonry over 300 years. 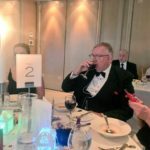 Images were also displayed on overhead screens of the diversity of many modern day Lodges, using social activities which have used to attain and retain its membership, we were pleased to have been one of those selected by Grand Lodge of the Annual North Harrow Lodge Sailing Trip. Music from Gilbert and Sullivan (the Mikado) and from Mozart (the Magic Flute) combined with extracts from the ceremonial delivered with Shakespearean panache……and throughout the celebration meeting I was alternately moved and informed by the display of both history and the aims & ideals that survive today. Sir Derek Jacoby gave a bravura performance and the ladies who played Faith, Hope & Charity were exemplary. There was even a tribute act to Cab Calloway with “Mini the Moocher”. To watch a Grand Officer singing “Hi dee hi dee hi – hoo de hoo de hoo” was priceless. “I Vow to Thee my Country”, “Jerusalem” and the National Anthem (two verses) were ‘sung’ with gusto and enthusiasm with mixed results but it filled many an eye – mine included. A replacement Ark was inaugurated to replace the one that was lost to fire in the nineteenth century (I think) and will be on display in the main temple in future. The original contained the original articles of association drawn up at the ‘Goose & Gridiron’ and the new one contains copies of those articles and the original three great lights from the one of the four lodges that made up the Premier Grand Lodge of 1717.
was the venue for what was a sumptuous affair with about 2,000 brothers being fed royally on a superb meal of treacle-roasted beef fillet and the red wine, which was just fabulous. Great chance to catch up with old friends and make some new ones. Brethren, do make an effort to make the 400th – I know I will ! For it was in that year that we continued to initiate candidates who had mostly been referred to us through our newly constructed website. 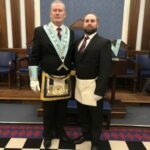 It was also a year that we had already initiated 6 candidates during the year, but most importantly, it was a year that at our October 2012 Installation Meeting we had the pleasure of initiating another candidate, that of Leonardo Monno, who was to be the seventh initiate that year AND NOW in …. 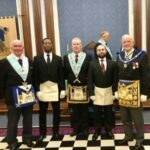 On Friday 13th October 2017 after watching him proudly progress through all the junior offices of the Lodge, we had the pleasure of installing Bro Leonardo into the chair of King Solomon as Worshipful Master of North Harrow Lodge and with almost 40 in attendance at the meeting, we were yet again blessed with a superb ceremony, including little gems like the 1st degree working tools delivered in Italian to the surprise of our newly installed Italian Master (did I detect a little tear?) The 2nd degree tools were delivered by our Serbian Junior Deacon and the 3rd degree tools delivered by our West African Senior Deacon all in an exceptional manner. It was also special as we welcomed W.Bro Maurice into our midst as a joining member of the Lodge, squeezed in a presentation of a Grand Lodge Certificate to Bro Aiedan and culminating in Bro Secretary reading yet another registration Form ‘P’ for an initiate in January, (advancing our membership to 42), and the singing of both the English and Italian National Anthems brought a fitting end to a very long but most enjoyable meeting, giving everyone just enough time to dash to the bar to quench the dry throats. 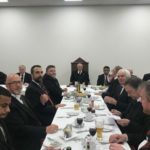 Was a delight, in the newly refurbished Harrow dining room at the Harrow Masonic Centre and amidst the usual hubbub of chatter, laughter, copious amounts of great food, wine and a rendition of the Masters’ Song delivered superbly by one of our resident guests W.Bro Phil Scully. An end to another great meeting of fun fellowship and ritual to die for. This entry was posted in Uncategorized on October 21, 2017 by admin. 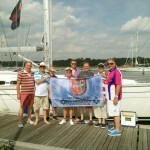 For the 6th year running, a few North Harrow Lodge members gathered for their annual sailing weekend at Hamble Point Marina on a Friday afternoon in July where we had arranged the charter of “Tenacious” an almost new 34′ Hanse Yacht . 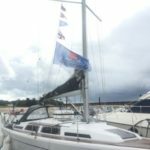 With a slightly reduced crew this year, this yacht was a perfect size for the trip, with mod cons like a self tacking headsail so the winches were not always needed and spacious sleeping and living accommodation. Pure luxury for us city salts. The next morning, the weather conditions were not entirely in our favour with persistent rain forecast, so after a hearty cooked breakfast of sausage, bacon, egg, beans and black pudding, we hoisted our Middlesex Masonic Flag and burgees of the East India, R.A.F and City Livery Sailing Clubs and ventured down the Hamble on a full stomach and into the Solent, enjoying a great sail never the less and reaching Yarmouth Marina in the afternoon, securing a mooring on the town quay and a well earned rest. We decided that the best option for the evening was to venture into town and sample the delights of the island, rather than be subjected to more cooking from the ship’s cook and ended up in the local hostelry enjoying a lovely dinner and consuming several glasses of Fuggles. 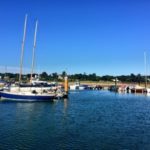 On Sunday morning we were greeted with glorious sunshine and great conditions for sailing. How wrong we were !! 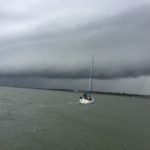 The Solent has its own micro climate and what you see can change in minutes and it did. Half an hour after clearing the harbour the skies darkened and we prepared to don our wet gear just in time for torrential storm. 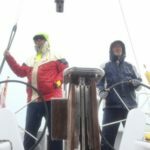 The wind was definitely in our favour even if the rain wasn’t. But we arrived back safely back in the Hamble later that afternoon and made our separate ways home with stories of high seas, serpents and pirates. Almost as good as any fisherman’s tale. Already looking forward to next year’s trip. Trooping the Colour 2017 is one of Britain’s finest traditions and once again members of North Harrow Lodge accompanied by partners and guests had the pleasure of attending this year’s spectacle. The event held on the 10th June was The Queen’s Birthday parade , ‘Colonel’s Review’ which is the final dress rehearsal before the main Parade next week where the Queen takes the salute. This year Prince William, Colonel of The Irish Guards had the honour of presiding for the first time in uniform riding his horse Wellesley. We were very fortunate to have been blessed with glorious sunshine throughout the ceremony where the Colour being trooped was presented to 1st Battalion Irish Guards by Her Majesty The Queen in 2009. Music was played by 400 musicians of the Massed Bands, Drums and Pipes of the Household Division, supported by The Household Cavalry, King’s Troop Royal Artillery, reinforced by Guardsmen from all five Foot Guards Regiments, 6 groups in all numbering 426 men and 200 horses. Amid high security, more than 6,000 spectators watched the event in Horse Guards Parade. 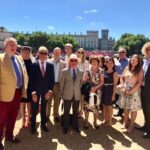 The streets are lined with crowds waving flags as the parade moves from Buckingham Palace and down The Mall to Horse Guard’s Parade, alongside Members of the Royal Family on horseback and in carriages. After the Parade, all 17 of us went off to a nearby restaurant for a lunch and refreshments ably booked by our Assistant Secretary completing another brilliant end to another successful social event for North Harrow Lodge. Like most Lodges, we have always regarded our meetings as being special and the culmination of hours and sometimes days of hard work put in by the members at the weekly or fortnightly L.O.I’s. But once in a while one comes along that has to be acknowledged as exceptional. Last night was one of those meetings. Last night we performed a Third Degree ceremony for our youngest member, who was initiated in January and had only recently turned 22 years old. I could only imagine how nervous he must have felt not knowing what was in store for the next couple of hours. However, the ceremony was pure theatre with ten brethren seamlessly appearing and disappearing in the gloom of that glimmering ray, delivering some of the best and heartfelt ritual I have heard in many a year, remembering that most of these guys have only been in Freemasonry for a short amount of time, which showed their commitment and love of North Harrow Lodge and the craft in general. 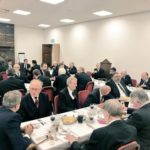 The Festive board was also no exception, Great food, fellowship, fun and a fitting end to the last Lodge meeting of the season. 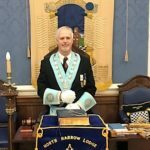 we now can look forward to the activities and events that we have in store for the summer and of course a new Master taking the chair in October. Why not book your place now and come join the fun. 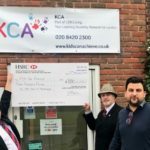 £2m in less than 2 years ! This is what the brethren of Middlesex have raised, it is a wonderful achievement.